It looks like Instagram wants to increase the reach of its popular feature Stories. According to Matt Navarra of The Next Web, Instagram is testing a new feature that allows people to share their Story directly to Facebook. 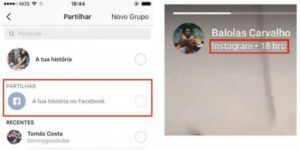 The feature which is being currently tested on a small number of people in Portugal, adds an option to simultaneously share their image or video story to Facebook before uploading to Instagram. Instagram first rolled out Stories in August last year and the feature has been a hit especially with young users. Following its success on Instagram, Facebook launched Stories for its mobile app in March this year, butb it has failed to impress its users and is not getting enough traction. The social network is currently testing Stories for desktop. It must be noted that currently, Instagram allows users to share individual photos or videos to Facebook. It is doubtful if the ability to share Instagram Stories to Facebook will in turn increase engagement to Facebook Stories.